Living in a big city and large apartment building can often mean that there’s never the right opportunity to get to know the people living right next to you. 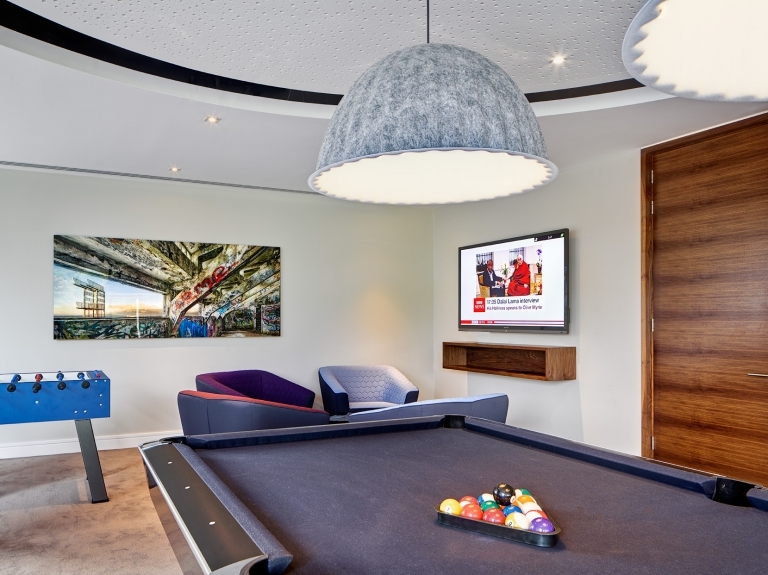 The reality is that you can inhabit much of the same space, sharing amenities like the gym and social areas without ever actually speaking to any of your neighbours. 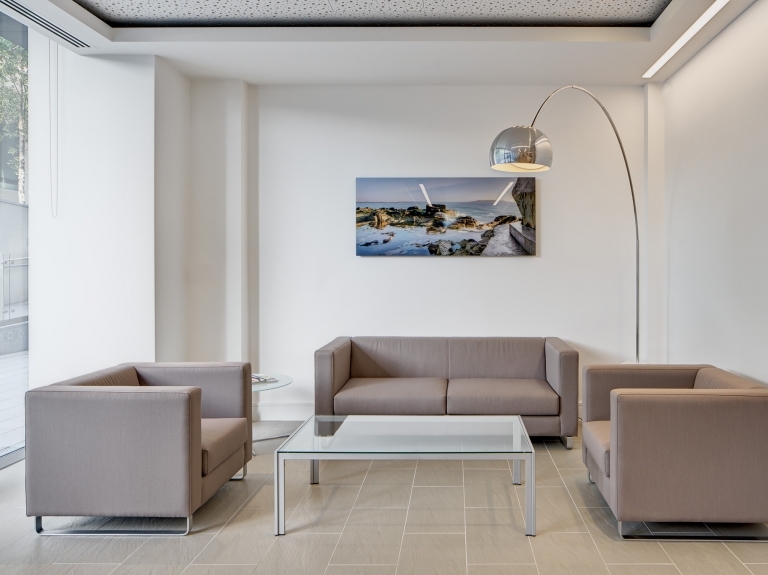 Kennedy Wilson, a global real estate investment company, and architects Henry J. Lyons wanted to change all that with the Vantage Apartments in Dublin. 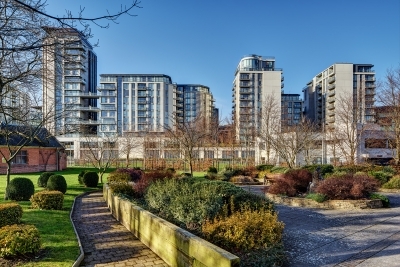 The Vantage Apartments were built as a series of buildings in South Dublin on three elevated landscaped courtyards, and there are spectacular panoramic views of the city from the inside. With a prime location near the sea and the mountains and clad in floor-to-ceiling windows, natural granite, reconstituted stone, and rich red sandstone, there was already a strong connection to nature. Enda Cavanagh’s fine art landscape photography was set to solidify that connection even more. “The external areas of the building are hard, and we wanted to soften it within the building,” explains Jane McHugh from Kennedy Wilson. The idea was to create a peaceful atmosphere where the residents could congregate. They had their heart set on artwork of the Irish landscape, as a nod to Ireland for their many international residents. Kennedy Wilson felt Enda Cavanagh’s landscapes had the right vision: “The sea, the forests, Sandycove, Blackrock. He had the look we wanted, and that Irish connection,” Jane adds. Jane had seen Enda’s work in another office scheme, and a very large photo in the boardroom had made an impression. He also came highly recommended by Henry J. Lyons. Enda visited the apartments to examine the space with the architects and discussed ideas with the interior designer to get a clearer picture of the kinds of photographs they liked. 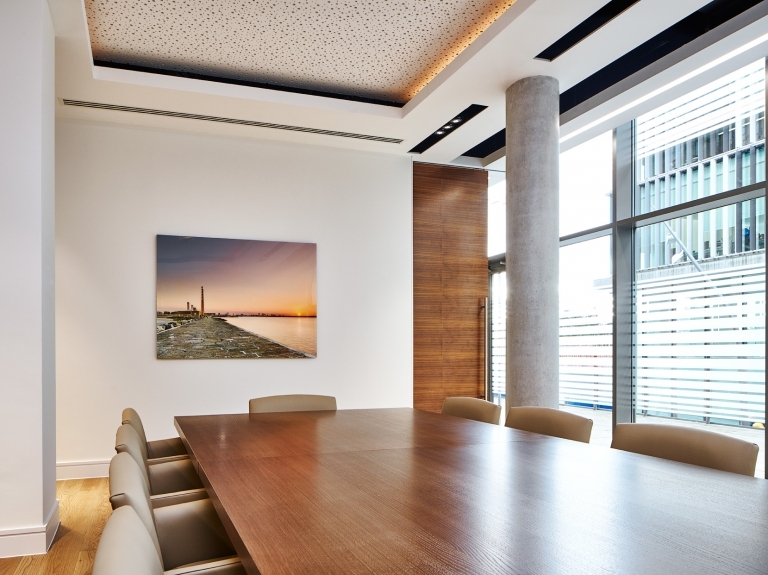 He took pictures of the space and created a montage with some selected pieces, so his clients could see how these large images would look in the rooms. 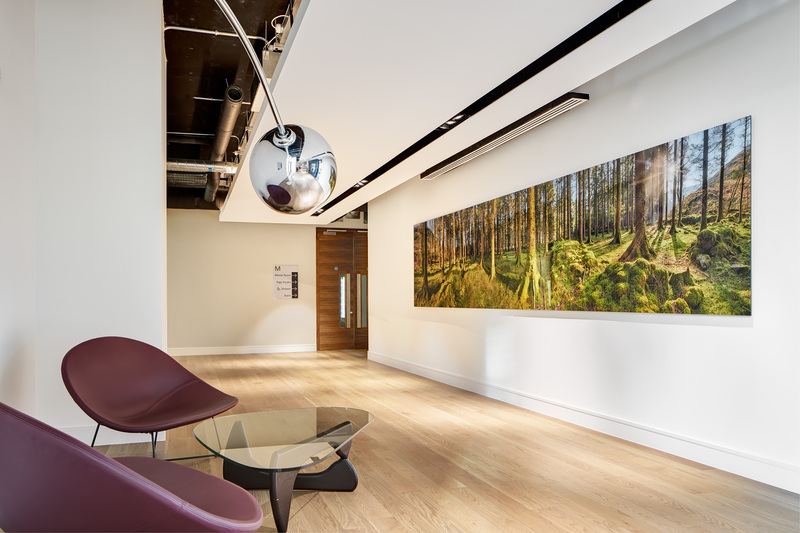 Kennedy Wilson settled on four landscape fine art photographs: three smaller ones for the social area and one large 5-metre forest scene for the reception. “They’re beautiful pieces. We would have loved to have a few more. 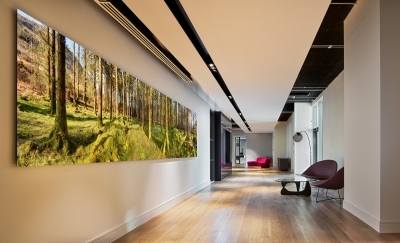 Our residents appreciate the fine art photography in the building, particularly the large piece. They’re always commented on; they’re very attractive,” Jane concludes. If you would like to discuss a fine art photography commission in your workplace or home, please feel free to contact Enda.